What's for dinner? 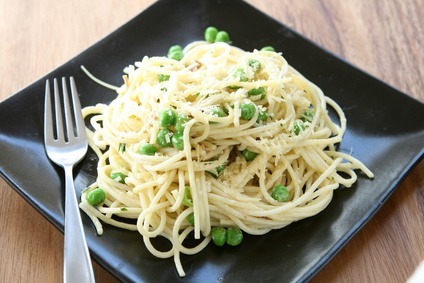 These homemade linguine recipes make dinner a breeze to prepare - delicious too. 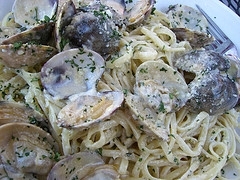 Offering an outstanding garlic and butter sauce, red or white clam sauce below. Heat oil in a heavy skillet that will hold the clams in one layer. Add the garlic, parsley, basil, pepper, oregano and little neck clams. Cook over medium high heat, shaking the pan occasionally until the clams open. Remove the clams from the pan and add the 2 cans of minced clams (liquid and all) to the skillet. Bring to a boil and cook, stirring, for 5 minutes. While the sauce is cooking, boil pasta according to package directions. Drain and put on a warmed platter. Pour the clam sauce over the pasta and top with the clams in shells. Melt the butter in a saucepan. Add the flour and cook, stirring over lower heat for two minutes. Add the milk gradually, stirring until the mixture is smooth. Cook until sauce thickens. Add salt and remove from heat. Cook linguine in salted water until al dente. PREHEAT oven to 375 degrees. Grease a baking dish. Drain linguine and add to the sauce; toss to mix. Place in baking dish and sprinkle with the cheese. Bake for 10 minutes. Serve with garlic bread and a tossed salad. This linguine recipe is for a beautiful red clam sauce. You may also substitute clams with mussels. Heat oil in a heavy skillet that will hold the clams in one layer. Add the garlic, parsley, basil, pepper, oregano, crushed tomatoes and little neck clams. Cook over high heat, shaking the pan occasionally until the clams open. Remove the clams from the pan and add the 2 cans of minced clams (liquid and all) to the skillet. Bring to a boil and simmer, uncovered, for 30 minutes. Add the clams in shells just before serving to heat through. While the sauce is cooking, boil pasta according to package directions. Drain and put on a warmed platter. Spoon the sauce over the pasta and top with the clams in shells. Melt the butter in a heavy skillet over medium heat. Add the onions, garlic, celery and cook until onions are transparent. Add the parsley, salt, pepper, oregano, frozen peas. Bring to a boil, then simmer uncovered for 15 minutes. While the mixture is simmering, cook the pasta according to package directions. Drain and place in a deep bowl. Add mixture to drained pasta and sprinkle with cheese. Toss gently and serve immediately. 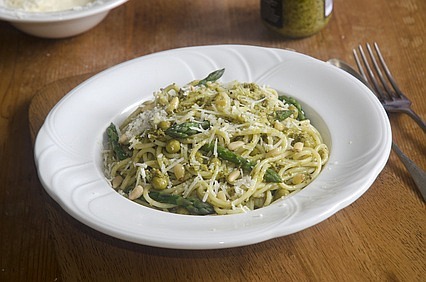 The following linguine recipes use asparagus and peas. Clean asparagus and snap off the tough ends. Cut the remaining spears into 1 inch pieces. Put the pasta on to cook, following package directions. Cook the asparagus in boiling salted water for 4 minutes of until tender (but still crisp), then drain. When the pasta is done, drain and put in a warmed deep bowl with the asparagus. Sprinkle with salt, pepper and oregano. Add the oil and toss to mix. Add 2 or 3 tablespoons of grated cheese and serve hot with additional cheese on the side. 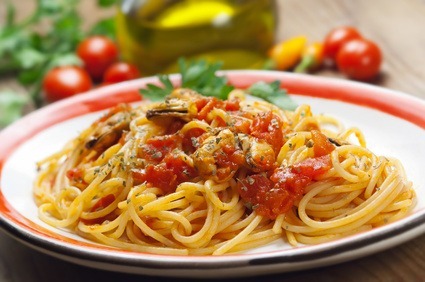 I have more than linguine recipes, please check out more of my favorite Italian recipes below.